Originally published in CO YOGA + Life Magazine, Summer/Fall 2017. When Beryl Bender Birch and I co-founded The Give Back Yoga Foundation in 2007, there were around a dozen non-profit yoga service organizations in the US. We wanted to support and fund certified yoga teachers in all traditions to offer the teachings of yoga to under-served and under-resourced people and communities, and inspire grassroots social change. Teacher trainees at Beryl’s The Hard and the Soft Yoga Institute wrote up their project ideas for increasing access to yoga, either through community service or yoga classes in communities living with poverty and trauma. “Yoga Service” is now a much larger movement, with hundreds of organizations and thousands of teachers offering their yoga therapy skills and knowledge outside of the traditional studio setting. We are now at a moment when the course of yoga service is significantly changing – a turning point, if you will – for three reasons. Social agencies, including prisons and juvenile detention centers, treatment centers for addictions and eating disorders, and VA hospitals, among others, are now adopting, and in many cases funding, yoga programs. For instance, in Cincinnati, OH the Hamilton County Veterans’ Court is treatment-based and creates a comfortable and safe environment where supports (employment, transportation, wellness activities, and others) are the foundation of sobriety and treatment. Mindful Yoga Therapy (MYT) is mandatory for veterans appearing in this courtroom. Attendance is considered one of the three self-help meetings required each week. And in the middle of America, Omaha, Nebraska’s Correctional Youth Facility (NCYF) recently started the first-ever weekly yoga class for incarcerated young men ages 16-21. NCYF is the only adult correctional facility for young male offenders in Nebraska. And the progressive warden, Ryan Mahr, understands that “hurt people hurt people.” So this year he hired Phileena Heuertz of Gravity, a Center for Contemplative Activism, to launch the yoga program at NCYF. This is just one restorative justice program in the local prison to help young men heal, stay out of the criminal justice system, and recover their best self. There are two success stories here: the people being helped, and the data being collected. Because of the track records of these cutting-edge programs, and because of the research that has proven the benefits to the populations served, in the future there will be opportunities to replicate these programs in other states. Gaiam, a consumer products and media company, has for several years donated thousands of yoga mats to kick-start yoga programs in schools, and for first responders, veterans, at-risk youth, the homeless, and people with mental and physical disabilities. Gaiam is now sending Yoga Readiness Kits, including yoga products and video content featuring yoga and mindfulness, to military bases around the world, including, among others: Fort Campbell, Ft. Stewart, Fort Bragg, Shaw Air Force Base, the Southern Command, and Seymour Johnson Air Force Base. Recently it launched a free video series for active duty service men and women. In October 2016, lululemon committed to a new community-based social impact program to create access to the healing benefits of yoga in at-risk and underserved communities, the Here to Be program. Its initial partners include the United Nations Foundation, Africa Yoga Project, Yoga Foster, LoveYourBrain, Give Back Yoga Foundation, and the Yoga Service Council. In recent days, a growing number of teachers have reached out to yoga service organizations, such as Hands to Heart Center in Boston, to volunteer their services providing free and accessible yoga classes for people living with poverty and trauma. Other organizations, such as the Newark Yoga Movement, are developing teachers with language skills from low-income communities and minority cultural backgrounds that reflect the diverse populations they serve. 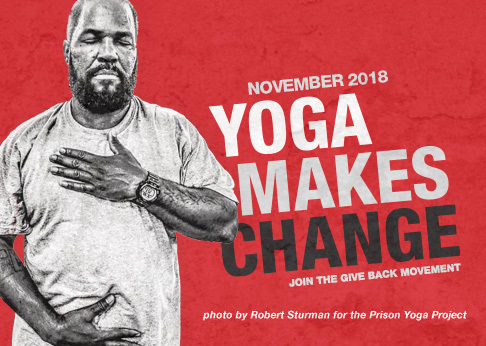 Our organization, The Give Back Yoga Foundation, continues offering free resources to thousands of prisoners, veterans, and active duty service members. Alongside these resources, in September 2017 we will be launching with lululemon/Here to Be a free online course for yoga teachers around the world called How Can I Serve? and a 200-hr teacher training focused strongly on yoga service led by Beryl Bender Birch. As uncertain as today’s reality is, the newly-sown seeds that I’ve described make clear that transformative change is sprouting and growing in the yoga service world, presenting us with inspiring opportunities for positive direction. Our work as yoga service organizations has never been more needed than it is today. We can all make a difference. Help us to bring yoga to those who need it most. Find ways to get involved today. This is an interview with Lisa Gabriella Mehos, a certified yoga instructor and nutritional coach. Lisa began her yoga outreach work volunteering in shelters during college. For the past three years, she has been teaching yoga to inner-city children and survivors of domestic violence in shelters and schools in New York City. I have seen how yoga service can help people transcend barriers of race, gender, and economic status. My motivation stems from my deep belief that everyone deserves compassion, kindness, equal opportunity, education and security. While we cannot eliminate the hardships people face in life, we can help empower those in need to overcome obstacles and trauma. Offering yoga in underserved communities provides people with tools to help build confidence, resilience, and a mindset to conquer difficulties and disadvantages, despite the many hurdles they face. Watching transformation in an individual, which might then carry over into the community, is the most rewarding aspect of yoga service. The greatest gift we can offer is sharing the tools and techniques enabling a person to overcome fear, anxiety, depression or other negative reactions to traumatic situations. By offering an affirmative practice and various exercises promoting virtues, we may help people develop hope, confidence, strength, and gratitude. A foundation built on these virtues can empower them to achieve their fullest potential. For example, one of the major issues facing us and our children today is bullying – not only in schools, but also in the adult world. By adopting a mindful practice, we realize we have the power to control our reaction and our response. Although we cannot control many things that happen in life, we can decide how to react in the face of adversity. We can choose to let cruelty, abuse, and hardship break us down, or we can take each obstacle and use it as a learning experience to make us stronger. One of my favorite quotes is “Never look down on someone unless you are helping him up.” My students have taught me that helping someone up has endless possibilities. Each of my students has a gift inside that cannot be bought or taken by anyone. To find it and nurture it, we all need someone to believe in us, stand by our side, and remind us of our intrinsic attributes and abilities. 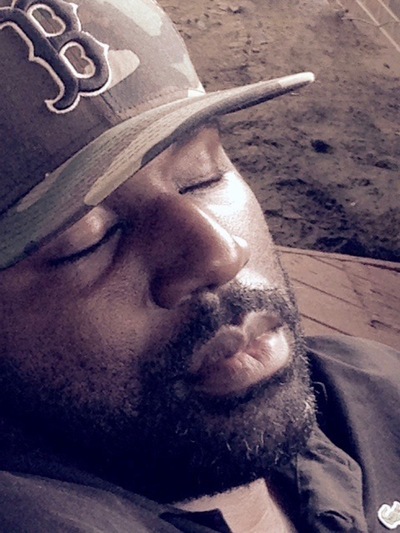 Yoga can address some critical factors for the homeless and those who face trauma and struggle. My classes incorporate affirmations – encouraging people to acknowledge, treasure, and reflect on their own self-worth and attributes. We focus on instilling confidence, compassion, and love, which emanate a powerful force that impacts entire families and communities. One eight-year-old boy living in a homeless shelter said he was grateful he got to go to school every day because he knew he would be so smart he’d be able to take care of his mom and baby brother. By reminding people they are strong, smart, kind, and capable of accomplishing their dreams, we can help our population flourish. Practicing mindfulness brings an element of compassion, gratitude, confidence, and kindness towards oneself. Once a person is mindful of his/her own intrinsic attributes, he/she is able to carry them over to others. When a yoga practice is presented with the intention to empower individuals, it can result in a transformation of attitude and values. Simply by following the most basic mindfulness practice of gratitude, we can reduce bullying, depression, violence, hopelessness. One of the most powerful factors of a mindfulness practice in the inner-city communities where I work is that we provide communities with a gift that is already in them. Only they can cultivate it and tap into it to accomplish any of their dreams. Wealth and power cannot buy this gift, or take it from anyone. Carry an open heart, an open mind…and a box of tissues! I’m so full of gratitude it often brings tears. Until someone spends time in these communities, that person may not realize what an honor it is to witness the resilience and love that exists, even in the face of the most egregious experiences and dire living conditions. I hope we can expand this amazing yoga service movement to reach far more individuals and communities. With every life we touch, we build strength in the right direction. I first met Lynne Boucher in 2014 at the Yoga Service Conference at Omega Institute. She had a flock of Nazareth College (Rochester, NY) students who were doing inspiring things both on campus and in the community. Lynne shepherds the award-winning “Yoga Revolution” on Nazareth’s campus, coordinating the service of eight yoga teachers and dozens of student leaders in offering extensive yoga programs to hundreds of faculty, staff, students, and alumni in the campus community. Along with a team of justice-minded yoga teachers, Lynne founded the Rochester Yoga Service Network (RYSN) whose mission is to share the practice of yoga with underserved populations in the Rochester community. 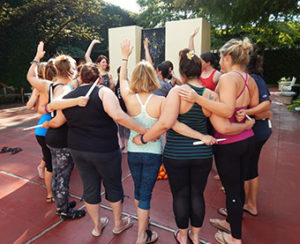 In a spirit of cooperation and community engagement, RYSN provides a supportive network for local yoga service providers, including training, reflection, and resourcing. Lynne’s off-campus yoga service work is primarily with urban youth – particularly through two local organizations: Teen Empowerment and Young Women’s College Prep. Once I experienced my own transformation through yoga in 2011, it was natural to share it with the students in my care as an interfaith chaplain and director of the Center for Spirituality at Nazareth College. My motivation to learn and teach yoga was deeply rooted in my desire to care for the college community’s spiritual needs. While I initially focused on students, I’ve been increasingly motivated to help foster the “overflow” of yoga love from our campus family to those in need in our surrounding community. Is there a standout moment from your work with Nazareth College students? One of the most powerful experiences I’ve had with yoga service took place at the last session of a summer program in which several Nazareth students assisted in a daily yoga class for 7th grade inner-city girls from Young Women’s College Prep. Our closing affirmation was followed by a gift for the girls: their own yoga mats, which made the girls shriek with delight. It was breathtaking to see our Nazareth students pass on the love they had themselves discovered. This scene continues to inspire me: sharing yoga love with a group of students on campus, so they in turn can share that love with others. What did you know about the college population you are working with before you began teaching? What were some of the assumptions you had about this population, and how have those assumptions changed? During my years in higher education, I’ve learned about the mental health struggles of many college students. Statistics from Nazareth match national trends: over 20 percent of incoming students arrive on campus already medicated for various mental health issues. While this college population was familiar to me by the time I started teaching yoga, many off-campus populations we serve were not. Yoga Service Conferences have helped our yoga service leaders become more aware and sensitive to issues of cultural difference, power, inclusion, and trauma. In addition, RYSN offered trainings for yoga teachers led by mental health professionals with expertise in trauma and healing. I’m grateful that yoga programs at Nazareth are explicitly and unapologetically spiritual. We understand that yoga is a spiritual practice that helps individuals tune in to the sacred within themselves, their everyday lives, and the world at large. Yoga classes at Nazareth are coordinated through the Center for Spirituality, and include spiritual themes and meditations uncommon in more secular or gym-based yoga settings. The teaching style of Nazareth yoga teachers is also characterized by a trauma-informed approach. We know from research and years of pastoral care that many yogis in our classes have suffered trauma in their bodies (sexual assault, cutting, eating disorders) and benefit from a high degree of sensitivity and care. We have learned that empowering students to make choices about their own bodies is a powerful way for yoga to be a healing force in their lives. As yoga teachers, we recognize our critical role in giving students tools to foster healthy habits and choices. However, we’ve had to acknowledge that our students’ spiritual, emotional, and physical needs far exceed our capacity to serve them, and many students need additional support. To meet this challenge, we collaborate with other campus departments to provide complementary services, such as the Health and Counseling Center, Women’s Health Club, athletics department, and PT clinic, among others. We listen to students who develop creative programming ideas, such as an annual yoga retreat, and specialized yoga workshops. What advice would you give to anyone who is going to teach college students? I would encourage campus communities to lay the groundwork for a positive understanding of the connection between spirituality and yoga. Also, teachers must become aware of their own attitudes to power, privilege, diversity, and inclusion when working with populations of diverse cultures, races, gender identities, sexual preferences, body sizes, etc. Anyone working with college students should assume that a majority of them are dealing with extraordinary amounts of stress, anxiety, depression, and angst. On a positive note, national studies reveal that these emerging adults are eager to explore their spiritual life in non-traditional and unconventional ways. Yoga has attracted students from “all faiths and none,” who want to explore the connections between mind, body, and spirit. The evolution of yoga at Nazareth has broadened my sense of service. I now see service to our students as a stepping-stone to service in the wider community; I understand yoga as a lifestyle, a way of being in the world. And I believe yoga is affecting our campus culture as hundreds of yogis learn, both individually and collectively, to forge a more peaceful, centered, and healthy way to live. My own practice has ultimately become necessary to my ministry at Nazareth, an antidote to the burnout plaguing myself and my dedicated and exhausted colleagues. My yoga practice has also led me to greater connectedness with other people, through acro yoga and group yoga, as well as deeper connectedness with nature through outdoor yoga and paddleboard yoga. With every passing year, I realize my ability to serve others is dependent upon my commitment to centering and nourishing myself through meditation and yoga. My commitment to social justice makes me deeply concerned about the accessibility and affordability of yoga. My hopes for yoga service lead me to speak out actively against a popular approach to yoga that is high-priced, image-focused, and profit-driven. I see yoga service as fostering an alternative to this consumeristic culture, by emphasizing cooperation over competition, inclusivity over privilege, spirituality over consumption, and social transformation over privatized gains. During a time when people feel increasingly disconnected from themselves, their bodies, their spirits, each other, and the earth itself, the yoga service movement can be a spiritual revolution! At the national level, the Yoga Service Conference will continue to foster awareness, and regional networks will begin to form in the coming decade. I hope that college campuses – always hotbeds for spiritual growth and community engagement – will join Nazareth in guiding the next generation of yogis to foster a lifelong commitment to their own spiritual development, and that of others.